Popularized by late, great Notorious B.I.G., this iconic phrase has always been a head-scratcher. I mean, whether you’re a marketer or not, more money is what we’re all after, right? And the problems that come along with that wealth? Well, we’ll take our chances with ‘em…amirite? According to one of my mentors Andrew… It’s ironic, really. So much of what we as marketers do, is deeply rooted in peoples’ pains, problems, and frustrations. And in fact, I think anyone selling anything could benefit from FLIPPING the script on this old adage. Marketers need problems to survive! If you don’t have a problem, you don’t have a product! Because at the end of the day, entrepreneurs are problem solvers. That’s how we make our living. In our info-product niche, people buy books, courses, and education because, well, they need ANSWERS to help them solve whatever pain, frustration, or problem they’re facing. Now, conventional wisdom might tell us that the more problems we can solve, the more potential our business has. Thing is, that’s not necessarily the case. The problem with this logic? If you run around trying to solve every single one of your prospects’ problems, you’ll drive yourself crazy. And in fact, you’ll sacrifice quality, clarity, and likely profitability in the process. That’s why it’s marketer shouldn’t focus on solving more problems, but rather solving their ideal prospects’ most pressing problem. Now, if you’re not 100% on whether or not you’re tackling the right problem, don’t freak out. Pinning down a problem is something a ton of marketers struggle with. Even massive name-brands have to do their detective work to suss out the right problem. But taking the time to do your due diligence may very well be your golden ticket to the most profitable business possible. The now household name (literally) is the go-to odor eliminator, passing a billion dollars in sales in 2011, and hey, you probably have some sitting in your pantry right now. However, when Febreze hit the market in 1996, the brand had a problem. Or rather, they didn’t have a problem! You see, Febreze initially ran a heavy slew of ads that stressed the product’s ability to eliminate odors. Worried about your clothes smelling like smoke after spending a night out the bar? Afraid that your dog is going to stink up your brand new couch? Febreze has you covered. Literally. Yet despite the ads being in heavy rotation, sales were stagnant. And Febreze’s marketing team was rightfully in panic mode. In an attempt to save their campaign, Proctor and Gamble (Febreze’s parent company) sent scientists out into the real-world to interview people about the smells in their lives. What they found was absolutely fascinating. People don’t smell their own stank! From chainsmokers to crazy cat ladies, those interviewed were completely ignorant of how their surroundings smelled. They weren’t just being stubborn, though. Ever heard of olfactory fatigue? See, once we’re exposed to a scent or smell for an extended period of time, both our noses and brains get accustomed to it. Good news for us, but not so good news if you bring home a date to an apartment that reeks. These campaigns were a hit. Not only were these ads amusing enough not to offend people (versus saying “Hey, you stink!”), but they also served as an eye-opener to a pressing problem that people had no idea existed. Because nobody wants to be known as the “smelly” guy or gal, right? And so Febreze managed to raise awareness to a universal problem that wasn’t on the table for consumers. What Febreze did might seem oddly proprietary, but the principle of tapping into the right problem is something any marketer can do effectively. Avoiding a crummy commute or soul-crushing office gig. Paying the bills without wanting to rip your hair out on a day-to-day basis. At this point, the wheels in your head are probably spinning. Well, it’s not going to come out of thin air. You’re going to have to hunt for it. After all, that’s what the folks at Febreze had to do. 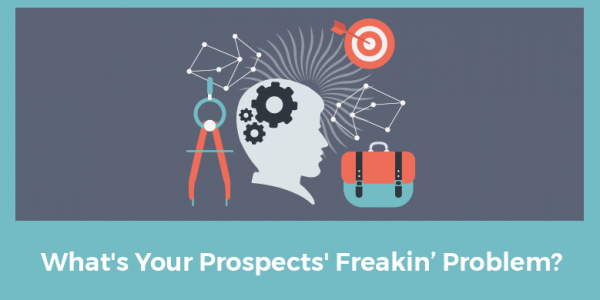 Thankfully, finding your prospects’ most-pressing problems is arguably easier than ever. It’s the fact that NOBODY actually has the problem highlighted. You need to hone in on a REAL problem that people actually have. And given how easy it is to find people’s pain points in the wild, there’s no need to treat them like a guessing game. If you spend above five minutes in a marketing-related Facebook group, you can find tons of pain points and problems of struggling business owners. The same rings true on Quora or the comments section of YouTube. Your prospects’ problems aren’t some big secret. People are more than willing to spill their guts online, which can clue you in on what’s keeping them up at night. Which leads us directly to our next tip, actually! There’s research out there that says the average person complains once per minute within any given conversation. In other words, we’re natural born complainers! And so, if you’re the one who’s willing to be a shoulder to cry on, there’s a lot you can learn about your prospects and the common threads between their problems. Perhaps they lack the technical know-how when it comes to marketing and ads. Or maybe they’re spending way too much time writing copy and emails. This creates the perfect opportunity for you to swoop in with the education or templates they need to get going again. Social media makes it so easy to pick peoples’ brains. The takeaway here is that interaction with people is essentially going to validate whatever your problem might be. Remember: Febreze didn’t figure out their big problem until they went out “in the field,” so to speak. Walking in your prospects shoes and seeing what their lives are like can help you double-check that their problem actually exists. Problems such as struggling to make more money or escape the rat race are compelling ones. That said, they’re also incredibly broad. There are tens of thousands of established “gurus” and authors competing in the “make money online” space. That’s why it really pays for network marketers to “niche down” rather than try to compete with the established bigwigs out there. This means getting specific with how you frame and position yourself as a problem-solver. For example, you don’t want to be the “make money online” marketer. Instead, you want to be the “make money online with psychographically-segmented Facebook ads” marketer. You need a differentiator; something unique and compelling, so you stand out from the crowd. Getting specific with your framing might also mean going after a laser-targeted audience, whether it be a certain demographic or ultra-specific niche. Either way, positioning your problem-solving skills (think: psychographics) does double-duty of not only getting specific, but also framing a solution as well. 3. Don’t forget to promise a solution! This is definitely worth noting, even though it might seem obvious. Bringing up problems and pain points in your marketing is a brilliant way to tug at your prospects’ heartstrings and get their attention, of course. But you also need to present an actionable solution to whatever your problem might be. After all, you don’t want your ads and copy to put people in a pit of despair and just sort of leave them there. Because harping on a problem over and over can be mentally exhausting. Hint: you can’t demotivate people into taking action. Once you identify a problem, you need to shift towards the positive outcomes of fixing said problem. There always needs to be a light at the end of the tunnel. And while the end-game might be to point people to whatever your selling as that very same light, you need to show them that you’re the real deal first. That’s why value-infused marketing in the form of Facebook Lives, blog posts, emails, and things like lead magnets are so valuable, as you offer insight in how to get out of that proverbial pit of doom. It’s well-documented that big companies dig like crazy through our behavioral data to learn how to better market to us. How we surf the web. Our credit card activity. The list goes on and on. And if you’re in the network marketing space, you might be surprised at just how much data you can gather yourselves on your prospects. This could be information from opt-in forms, emails, or search queries on your site. Or if you run a Facebook group or ads, you can get granular when it comes to your demographic data. Looking at your data can clue you in on what people are looking for in terms of content and education. And this is exactly how you’re going to find new problems to explore, by the way. Febreze is a shining example of this today. Meanwhile, they’re still rolling out new products and scents to fight the good fight against odors. Because if you want long-term customers, you’re going to need to continue to raise awareness of your audience’s problems. And by rinsing and repeating this checklist, you can turn people’s problems into a long-term, profitable business model. How are you speaking to your prospects’ problems? In this post, I’m making you aware of a problem. That is, the problem that most marketers struggle when it comes to identifying the specific pains of their prospects. And through this post we’ve explored some specific ways to take care of that problem. Maybe you weren’t aware of all the problems with problems when you started reading, but now you are? Funny how that works, right? Your prospects are the exact same way when it comes to the problems they face when it comes to growing their business. It’s just a matter of sniffing out those problems and presenting yourself as their much-needed problem-solver. Once you’ve sunk your teeth into your prospects’ problems, you’ve done most of the legwork. Now you just need to figure out how to effectively communicate that problem (and your solution) to them. One brilliant way to make it happen is through targeted advertising. Just about anyone can craft laser-focused ads in the era of Facebook. That is, if you know how. So if you’re ready to learn the proven tactics brands have been using for over 100 years to speak to their target audience’s problems without fail, we’ve put together a step-by-step tutorial that reveals our exact advertising process in a 100% FREE online workshop, hosted by none other than Tim Erway, co-founder and CEO of Elite Marketing Pro. You’ll discover how you can put together a profitable ad campaign in just 10 minutes a day with as little as $10 in initial ad spend. So if you haven’t registered yet, what are you waiting for? Pick a time that works for you to attend Tim’s traffic workshop right here.